In a conversation about ganking there are normally three participants. The ganker, the gankee, and the spectator. The ganker may gank regularly or may have ganked in the past but in some way they are actually experienced in a gank. Their reaction to ganking is often weighted towards the ganker. At times, having grown bored or bitter or simply too good at ganking their side weights back towards the gankee. Often, the supplemental opinions weigh them closer to neutral but still tipped towards the ganker’s perspective. The gankee is the person who has been ganked or is a gank waiting to happen. Their opinions weigh heavily towards features that will assist them in not being a gankee. There are a few members of this group that are fine with their gankee status without having ever been a ganker. Even the weighted opinions of gankee’s who do not have problems with the gank will never tip the scale towards anything but anti-gank. Spectators are wild cards. Their opinions fan out in a full spectrum. One never knows what one is going to get from a spectator in this conversation about ganking. Pros, cons, devil's advocacy. The spectator will speak from experience or not, emotion mind or rational mind it will always be a surprise. 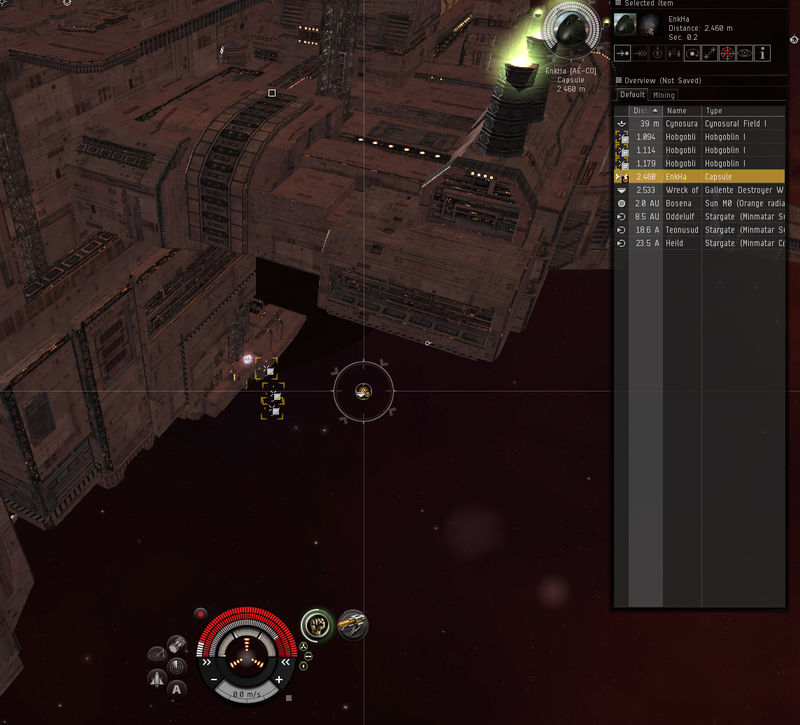 Ganking is a touchy topic in Eve. It is the over whelming force where the victim of the gank burns in a fire. I often see Low Sec termed as a land of ganks where there is no fight to be had but endless ganks as far as the eye can see. I disagree, having participated in more than one fight that was not a gank. I have also been the victim of ganks. My first loss ever was not a gank. It was me, floundering in my newbie innocence when I was attacked after trying to slow boat back to a gate when my autopilot was confusing me. I lost my pod as well. I was flying something silly like a max expanded Catalyst while moving my new found riches (level 5 salvage) out of low sec. Over time, I am often the ganker vs the gankee. I undocked in glee to kill an autopiloting Hoarder the other day. He was doing a courier mission it seems. And I was happy. Pewpew goes the Cynabal! It was a lovely evening. We had just had a not so successful engagement against two repping battleships following a sucessful engagement against another fleet. The fleet was spiraling down so that people could go play DOTA2 until the next op in about an hour. That allowed the non-dota playing public to get food and do errands. I was moving some stuff for myself and a few other corpmates. With the fleet done I woke my alts up to jump them to Bosena. As is the norm, I set up my cyno alt and jumped in my freighter and let my cyno wind down. I don't feel the need to destroy a million ISK module every cyno. An Algos landed on station and docked. I didn't think much of it. I dumped my items and undocked my jump freighter to head back to high sec. I was trying to do two jumps on the one cyno. The Algos undocked behind me but I thought nothing of it. My jump freighter warped off and with my cyno I kept my eye on the Algos. I mildly wondered why I had not brought Sugar along to cyno guard. The Algos sat on the undock for a while and then deployed three drones. It started to drift towards me. Oh. I undocked Sugar and bolted towards Bosena. At the slow rate the Algos was following me I might be able to save myself. Sugar was warping and the Algos approched. Around 15k it targeted me. That went on for a minute and then I heard the whining buzz of the shield alarm as it started to shoot me. My cyno alt is a neutral alt. She is not, however, a pure cyno alt. She is one of my most used characters. I just use her for cynos. The problem with her being neutral is that her sec status is around a 1.2. That means the Algos started to take gateguns. But, it wasn't dying fast enough and Sugar wasn't warping fast enough to save me/her/us (alts are weird). My shields were ripped away and my armor was ground through. I gritted my teeth during the onslaught and stared at the empty location where my DCUII is on every other ship. I hit structure. My cynos life was about to be snuffed out. A million ISK down the drain and another rookie ship I would have to spawn because this alt is Amarr and CCP hates Amarr rookie ships. I prepared to warp. Then the Algos died.Oh. That was unexpected. I didn't want to lose that cyno anyway. He sat there almost long enough for Sugar to get on grid. He warped off right before she landed. Damn. Oh well. Even the best planned ganks don't always work.